Excited about giving a much needed upgrade to your outdated bathroom? As one of the most used rooms in the house, hitting the reset button on the bathroom is a great investment. The experts at Advanced Plumbing have helped customers with several bathroom remodels over the years. We know what works, and what doesn’t. 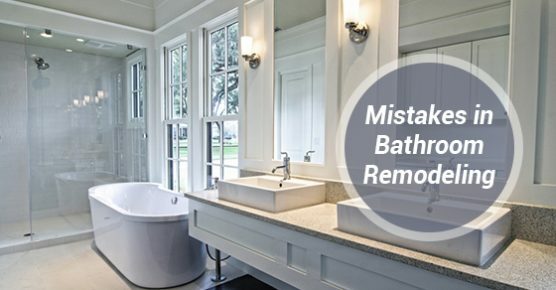 Here are some common mistakes to avoid during your upgrade that could end up adding thousands to your remodeling expenses. You can visualize your new bathroom in your head and wish it could be done tomorrow. We get it. But diving in without adequately planning could end up either pushing your spending way over budget or worse, the result not being what you had envisioned. Set aside at least a month to gather ideas, pin them to your new “bathroom board” on Pinterest, and get the plans drawn up. If you want to move the staples of the bathroom—like the toilet, shower, etc.—plan for walls and floors to be ripped out, completely new plumbing to be installed, and a significant addition to your budget. Your big plans are doable, just be sure to plan for the details. This way, you won’t be caught off-guard by the money and time it will take to create your dream bathroom. Yeah, we know that you want to save some money by doing your bathroom yourself. However, unless you have professional experience, it’s best to limit your involvement to the stuff you can do at the beginning—like demolition—or stuff at the end—like painting. If you attempt to take on something that you are not trained to do, it will cost much more to fix later. If you are looking to cut costs, do it elsewhere. Inexpensive flooring laid by a professional looks much better than expensive flooring laid by a do-it-yourselfer. Likewise, a feeble plumbing job may end up leaking and causing water damage, and there goes the new bathroom remodel! Although we just said you could skimp on materials in favour of professional help, there are some materials you shouldn’t skimp on. Invest in the things that get the most use. Quality plumbing is the most important thing in your bathroom. Make sure it will work! Sink fixtures with a lifetime warranty are well worth the extra cost. On the other hand, you can find toilets that are relatively affordable. Some of the highest rated toilets are only a few hundred dollars. While other brands that do the same job can cost ten times that amount! Keep the future in mind as you plan for your remodel. If you put a bench in the shower now, you won’t have to later when you need to sit to shower. Even though that steam feature or body spray showerhead may seem like the best thing to ever happen to your morning shower, what about a year from now? Extra features usually mean increased water or energy usage, which means an increased utility bill. You might end up never using your tricked out showerhead because you want to save money or are too busy. Nobody likes getting out of the shower and crossing the room to retrieve a towel. Think about how you’ll navigate your bathroom and how you can make it most convenient before you rip out a closet in favour of a dual vanity. Think about what you use most frequently, the things you’ll want to store in the bathroom, and what you need to have on hand. Even if you decide to get an armoire for storage, figure that into your budget so you don’t find yourself going without later on. A bathroom remodel is exciting, except when it goes way over budget, takes too long, and doesn’t come out quite how you pictured it. Take the advice of our plumbers—who have watched numerous remodels—and make sure yours is on the right track from the start!